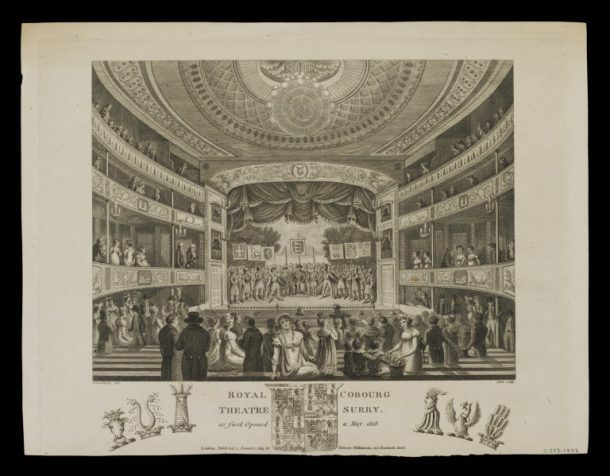 To mark the 200th anniversary of the Old Vic, guest blogger Pieter van der Merwe shares the story of one of the theatre’s first managers. A Theatrical Fracas!! !, or ‘The Lamp-Lighter’s Boy’ Trimming the Manager. 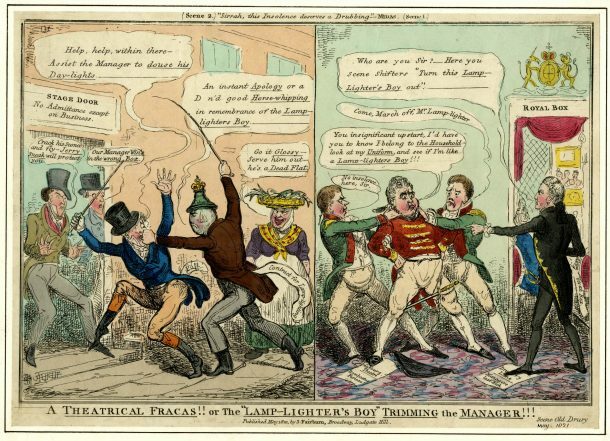 In 1821 Joseph Glossop was fined £150 for assaulting James Winston, acting manager of the Theatre Royal, Drury Lane, after Winston ejected one of his servants from the theatre. The liveried servant’s face is probably Glossop’s, the title a slur on the ‘trade’ source of his family wealth as wax merchants. ©Trustees of the British Museum. The ‘Old Vic’ has just celebrated the 200th anniversary of its opening in 1818. In February this year, announcing preparations for this, the current artistic director Matthew Warchus said his aim was not to eulogise the theatre as a ‘historic artefact’ but a place ‘characterised by mischief, populism, sometimes breath-taking boldness and risk.’ That tradition started with his earliest predecessor but probably not how he meant…. 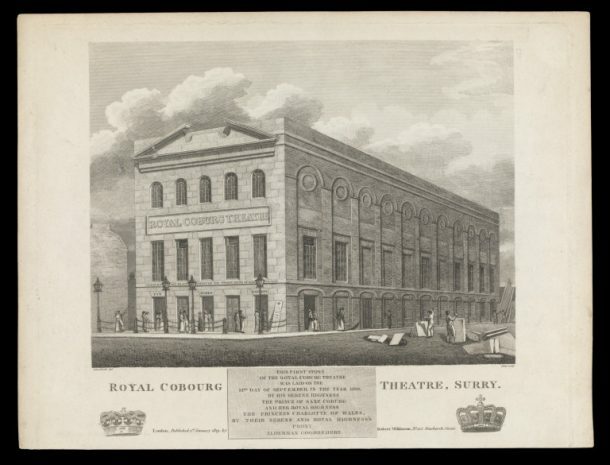 The ‘Vic’ was originally the Royal Coburg Theatre, named to honour the marriage of the short-lived Princess Charlotte (daughter of the Prince Regent, later George IV) to Leopold of Saxe-Coburg, future King of the Belgians. Construction began in then-rural Lambeth in 1816 but faltered until Francis Glossop, a wealthy Soho wax and tallow chandler, became involved. As a supplier of lighting for theatres, he had ‘imbibed the theatrical mania’ but his fifth and youngest son, Joseph (b.1793), caught the stage bug even worse. With family money Joseph completed and opened the theatre as its first manager on 11 May 1818, to early popular success, with an output of musical melodrama and spectacular action pieces. Young Joseph’s ambition was boundless: Glossop cash quickly bought out the other two main Coburg shareholders for £3000 each (about £180,000 today) one being its scenic director, the marine painter J.T. Serres, who had also lavishly decorated its grand Marine Saloon. By 1821, based on the house’s tenuous royal connection, Joseph had also become Clerk of the Cheque to the Gentleman Pensioners, allegedly as part of scheme to get a knighthood from George IV, and had taken on two more theatres. In 1819, he staged the first-ever winter season at Astley’s Amphitheatre, the popular horse-circus just south of Westminster Bridge (now under part of St Thomas’s Hospital), then in 1821 leased the old Royalty Theatre in Wellclose Square, Stepney, but almost as fast had to give up both places, claiming a combined loss of £2,800. In 1822, at further huge expense, he boosted novelty at the Coburg by importing from Paris a mirror-glass drop-curtain in which the audience could admire itself (‘That’s all werry well’, yelled someone in the gallery, ‘now show us summut else!’), but in November fled to the Continent ahead of arrest for forgery, probably of a financial document. While that ended his first Coburg stint, by late 1823 ‘il Cavaliere Glossop’ had materialised at both Milan and Naples, where his grandiose plausibility won him control of the two largest opera houses in Italy, La Scala and the San Carlo. This was part of a new project to establish his wife, Elizabeth Feron, – a talented soprano sometimes called ‘the English Catalani’– as an Italian prima donna. They already had two daughters, but by the time their son Augustus was born at Naples in June 1825, ‘il Cavaliere’ was also being evicted from both Italian managements with losses later reported as £200,000. He and Elizabeth separated shortly afterwards and she continued a successful independent career, starting with a period in America from 1828. Even before she sailed however – calling himself ‘Gapper’ Glossop (his mother’s maiden name) and a bachelor – Joseph bigamously married in 1827 at Livorno to Joséphine de Méric, a French soprano whose talents he began promoting around Europe. Their daughter Emilie (later also a singer) was born in Paris in 1830 but this marriage also quickly disintegrated. In March 1833, back in London, Glossop was declared bankrupt with debts of some £56,000, mainly accrued at the Coburg, which was renamed the ‘Royal Victoria’ later that year after a visit by the future Queen. He nonetheless still managed to reinstall himself as its manager, lavishly renovating and reopening it in September 1834 with usual panache and another mirror-glass drop curtain, but unpaid bills again soon piled up. In March 1835 his credit finally ran out when his father Francis died, leaving his eldest brother – the highly respected Revd Henry Glossop, vicar of Isleworth – as head of the family. Joseph was again made bankrupt but still managed to retain a small interest at the ‘Vic’, though his father’s will expressly lamented the expense, ‘torment and misery’ his youngest son had brought on him. From the grave, Francis urged that he receive no more than £2 a week further income from family funds, plus any surplus accruing from their interest as landlords of the ‘Vic’. Joseph was last spotted running a boarding house in Brussels in 1842, and just ‘as happy as when managing the Coburg and the San Carlo’. Like other economising remittance-men, he later moved to Florence, where he died in November 1850 and was buried – as ‘Joseph Buggles Glossop’ – in the English cemetery. This trail of ruin and scandal is glossed out of Burke’s Landed Gentry (into which the Glossops graduated from ‘trade’ by the 1890s) and ended more happily in Joseph’s children. Both his elder daughters were musical. Frances briefly sang as a pupil of the celebrated tenor John Braham: Mary Ann was a successful composer of popular songs and operas, with libretti by her also well-known husband, the lawyer and humorous writer Gilbert Abbott à Beckett. From 1851 their actor brother re-branded himself ‘Augustus Harris’ and became a successful international theatre manager with a long link to Covent Garden. His son, in turn, was the impresario Sir Augustus Henry Glossop Harris, who, at his death aged 44 in 1896 the critic William Archer considered ‘the greatest showman… that England has ever produced.’ Called ‘Druriolanus’ from his spectacular management of the Theatre Royal, Drury Lane (and jointly of Covent Garden), his bust still looks out from its entrance facade on Catherine Street, though his knighthood was a civic rather than theatrical honour. If the ‘Old Vic’ has a ghost it ought to be Joseph Glossop. It is his monument, as well as London’s second-oldest theatre after Drury Lane and the first home of the National Theatre (1963–76). In its 200th year it would at least be good to find a decent portrait of him: the only one known seems to be as ‘the Lamp-Lighter’s Boy’ in a caricature by Robert Cruikshank. He deserves better memory: without him, there would be no bicentenary to celebrate. Visit the Theatre and Performance Galleries to discover a display celebrating the Old Vic, on until December 2018. 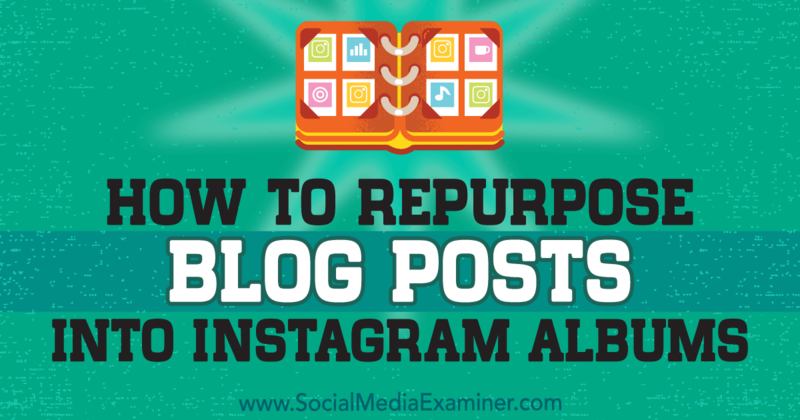 This post How to Repurpose Blog Posts Into Instagram Albums first appeared on . In today’s digital marketing landscape, a growing number of social media platforms and channels are competing for a limited number of marketing resources. Many brands are realizing that they can’t have an active presence across every single platform, and that they need to be strategic in how they create content for different channels. That’s why you need a content marketing strategy for your blog and social media posts. In the rush to create new content for social media, it’s easy to fall into the trap of just creating as much content as possible, and waiting to see what “pops.” The basic thinking here is that, if you create enough Facebook, Twitter and Instagram content, something is going to go viral sooner or later. The problem here, though, is that you might be creating the wrong content for the wrong customer. Or, you might be spreading your resources so thin that you are no longer staying true to your overall brand identity. Say, for example, you are a brand that prides itself on having a customer-centric focus and responding to all customer inquiries quickly and professionally. So what happens when you’re failing to check your Twitter feed, and a long string of customer requests are being left unanswered? That reflects negatively on your brand. Creating a content marketing strategy can be as simple or as elaborate as you would like. For example, some brands actually come up with a content calendar, where they think several weeks ahead about the type of content that they would like to post. This helps to keep everybody on the team updated on what type of content will be appearing soon, and helps to ensure a smooth, integrated marketing strategy. But you don’t need a formal calendar to make a content marketing strategy work. All you need is a basic framework about how often you are creating content. For example, 1 Facebook update per day, 2 tweets per day, and 1 Instagram photo every Friday. This makes it possible for different members of the team to handle social media responsibilities, without wondering: What in the world am I supposed to post today? Yes, social media has an ROI, just like any other form of marketing. And that’s where a content marketing strategy can help you generate the highest possible return. As part of any content marketing strategy, you’ll determine certain basic metrics — such as the number of new followers or the level of engagement — you can track. Then, over time, you can see how much you are moving the needle on these metrics. If you are seeing your Facebook followers “stuck” at a certain number, which might be a real clue that either you’re not updating the page enough or you’re posting content that’s not resonating with customers. By setting up a content marketing strategy, you’ll have real insights into the performance of your social media campaigns. And, best of all, you won’t wake up one morning to find out that one of your team members stayed up late last night, firing off a series of tweets that are completely off-brand. Accountability in marketing means one thing: can you deliver on what you promised? Get this Guide to Advertising Accountability to see how revenue accountability can cut marketing costs by reducing waste and dramatically improving your ROI. This article originally appeared on Social Media HQ. This post Nominate Your Favorite Social Media Blog: 8th Annual Top 10 Social Media Blog Contest first appeared on . Nobody’s correct all the time. Your blog posts, on the other hand, should be correct all the time. Why? Because if your blog gets the facts wrong, your readers won’t take you seriously. Instead of being an authoritative resource, your blog will become a joke. It’s harsh but true. Assuming you’re not a satire site like the Onion, you need to get your information right. Truth be told, blogs should have similar standards for their posts as colleges have for students’ papers. 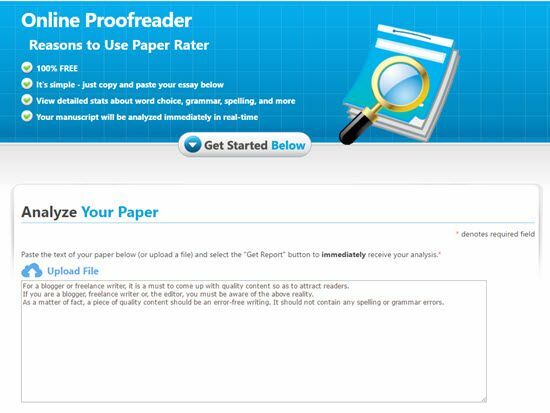 Colleges require students to cite their sources in detail, and the sources have to be credible. While I don’t think blogs should be required to quote only academic journals, I do think most blogs could benefit from higher standards of quality. That means no poorly researched facts, no half-baked ideas, and no generalizations or assumptions. It means thoroughly researched points, credible sources, and specific examples and anecdotes. That’s the standard I keep for all my blogs, and I encourage my friends and colleagues to do the same. Best of all, it doesn’t take hours to make your blog posts bulletproof. 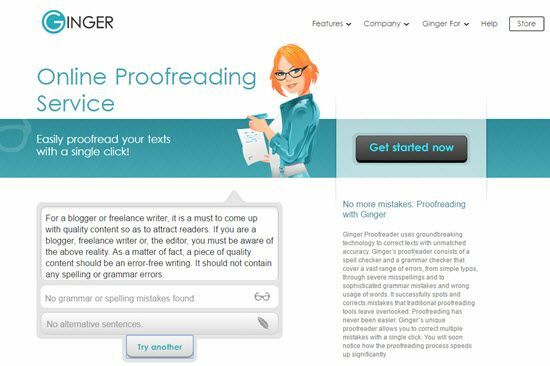 Here’s how to fact-check your latest blog post in 20 minutes or less. Let’s get started. You don’t need to be super paranoid to have a perfectly correct blog post. Not every fact needs to be double-checked. That’s why your first objective should be to comb through your post and determine which facts need checking. An easy way of doing this is to consider whether or not the fact is common knowledge. For example, the fact that Barack Obama won the 2012 election is common knowledge. But the fact that Obama likes basketball is not common knowledge. How can you tell whether a fact is common knowledge? Purdue University’s Online Writing Lab says that, as a rule of thumb, if you can find the fact undocumented in at least five credible sources, chances are it’s common knowledge. If your fact is common knowledge, you don’t need any source to back it up. However, I recommend doing a quick yet thorough Google search to make sure your fact isn’t a common misconception. If all looks good, move on to the next step. There’s a huge difference between an authoritative source and a credible source. Unfortunately, most people think they’re one and the same. For example, most schools don’t allow students to cite Wikipedia because anyone can edit it. Even though Wikipedia is mostly well-maintained, it can’t be used academically. Wikipedia is a perfect example of a site that is an authoritative—but not credible—source. It’s authoritative because it’s used by millions of people, but it’s not credible. The Wall Street Journal is an example of an authoritative source that is also a credible source. Most major news publications (e.g., The New York Times, USA Today, Washington Post) count as credible sources. Keep in mind that while some of these sources would be considered off-limits in an academic setting, they’re perfectly fine in our case. For example, using a personal site for a grad paper might be frowned upon, but it works fine for blog posts. Ultimately, you have to use your judgment here. If you’re using well-known, widely trusted sources, you’re good to go. There are also plenty of sites and resources dedicated to fact checking. Usually, these types of watchdog sites cover either politics or urban myths. For example, FactCheck.org and Politifact.com are two sites that help you determine the validity of political statements. One of the most popular checking sites is Snopes. It has entries on all kinds of urban legends and controversial facts. The team of researchers at Snopes always show their research, making it easy to fact-check Snopes itself. While Snopes has gotten some criticism for its seemingly biased political articles, it’s a good resource for many other topics. Last but not least, Google recently announced its new Fact Check tag for Google News. 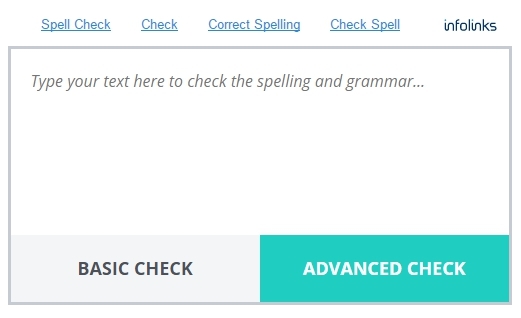 In a nutshell, readers will be able to check the validity of an article by clicking on the Fact Check tag. If you’re already using Google News, this will be super convenient for you. And if you’re not using Google news, it’s a great time to start. I’ve shared a lot of information so far, but don’t be intimidated. As I promised, you’ll be able to use this info to fact-check a blog post in 20 minutes or less. Let me take you through the strategy, step by step. Open Microsoft Excel or Google Sheets, and create a new spreadsheet. Don’t worry, you’re not going to make anything complicated. You’ll need only three columns. Name the second column “Sources.” We’ll use this in the next step. Name the third column “Use.” You’ll use this column to determine the validity of your facts. If your facts don’t fall into any political, social, or mythological categories, Google will be your first step in the fact-checking process. For example, if you wanted to write about the successful use of Facebook video ads, you’d want to find a reputable source with examples. The article has lots of outbound links to support its claims, which is a great sign. There’s also a lot of media to help the user follow the strategy. This is an excellent example of a good resource. This article would definitely back up your claims about Facebook video ads being successful. Try to find at least two quality articles, studies, or videos to back up each statement. 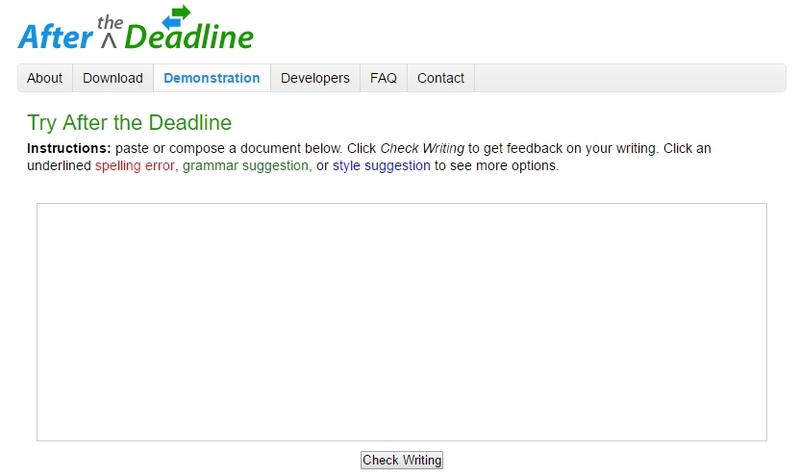 This way, you can go through them at the end and decide which resources will be best for your article. When you find your sources, paste the links in the “Sources” column of your spreadsheet. If you’re writing about anything political, you’ll most likely need to use FactCheck.org, Politifact, or Snopes. And if you need to check any facts related to society, Snopes is a good place to go. 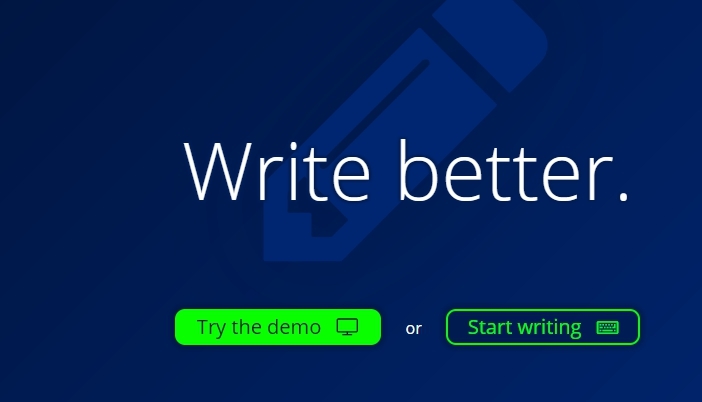 You won’t need to use these sites for every article you write, so this is an optional step. If you do need to use these sites, just run your topic keywords through the search bars. A lack of support means one of two things: You either need to support the fact yourself or eliminate it from your article. Since these are polar opposites, you’ll have to use your judgment here. For example, if you’re arguing that studying the Renaissance can improve your marketing, you probably won’t find much out there that connects the two. But you can probably make a strong case for why it’s true. On the other hand, if you’re arguing that the Loch Ness monster’s favorite color is blue, you won’t find anything to support that. And you probably can’t create a convincing case that backs up your statement. Overall, if you have a hard time backing up a fact, you should leave it out. You are better off being safe than sorry when it comes to fact checking. Take a final look at your spreadsheet. If you found at least one credible source for a fact, you can use that fact. Enter “Yes” in the “Use” column. If there are any facts without sources, you’re better off not including those facts in your article. As I mentioned above, if you can make a compelling case for a fact, go for it, but be careful. You’ll come across a few duds every now and then, and that’s okay. When it comes to facts, always choose quality over quantity. While this is a quick-start guide, don’t be afraid to spend a little more time on this process. Getting your facts straight can mean the difference between a success and a flop. And keep in mind that the longer the blog post, the more research you’ll have. To give you an idea, my posts run anywhere from 1,500 to 3,000+ words, and I typically spend about an hour or so on research per post. Of course, the most important part about writing a blog post is making sure the content is awesome. Write to solve your readers’ problems, and be passionate about it. Thanks to the Internet, fact-checking has never been easier. Take a few minutes to double-check everything, and you’ll never have to worry about misleading your readers. What’s your favorite fact-checking tip? As we approach the end of the year it is always instructive to review the top performing blog posts of the past twelve months. 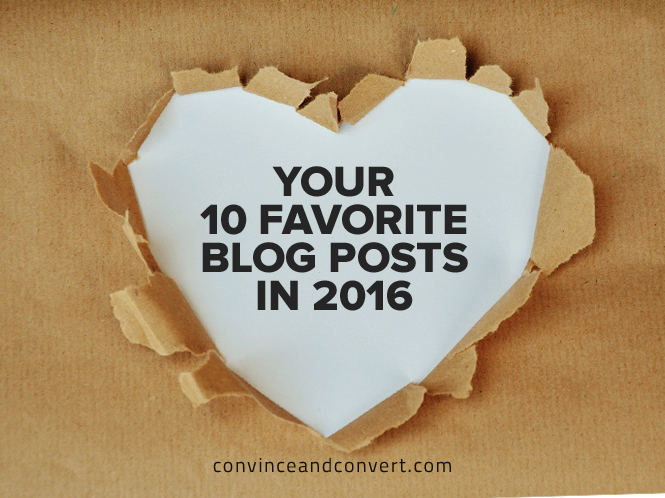 As Modern Marketers we need to know what types of posts resonate with our readers. This understanding of our audience helps us plan for the coming year. When things work, you want to do more of them. When they don't, you stop. This product announcement was the top performing post for the year. As we focus most of the content on the blog at the top of the funnel, without a heavy dose of product information, it is instructive to analyze why this post out-performed all others. In a word, or an abbreviation, ABM. The announcement that you could finally do account-based marketing within Eloqua was a really big deal for our audience. This post resonated so much with our audience that we added an ABM category to blog, where we regularly publish stories on the topic. It was a big thing for Modern Marketers in 2016 and it was a big thing for us. Everyone loves the Markies, and the coverage of the 10th Anniversary of these coveted awards earned two of the top spots in our top ten posts. Both the announcements of the finalists and the winners showed that readers are interested in companies that are executing marketing strategies better than others. These are also posts that appeal to both customers and prospects. Pop culture references drive traffic, but they really drive traffic when the posts provide real insights into the topic. This was masterfully demonstrated by one of our strategic consultants. Plus it has a picture of a dragon. These two posts are how-to posts for email marketers, both written by internal subject matter experts. The mission of our blog is to help Modern Marketers do their jobs better. These posts show that our readers respond to our mission. Another how-to post that provides some practical advice from a marketing automation professional. Our readers like to know what's coming and where we have been. The first post is from the CMO of one of our partners who stressed the importance of video in the coming year. The second post was part of our look back/look ahead series of content. This was part of an award-winning content campaign with lots of campaign elements driving traffic back to this blog post, among others. And finally, we make sure we share the latest industry analyst reports on our blog to help our prospects learn more about they types of products that they are considering and to help our customers be confident that they have made the right choices in their martech solutions. Make sure that you don't miss any of the top posts of 2017 by subscribing to our weekly blog newsletter.